For the last month I have been consumed with nothing except my exams but now: Back to shoes! Yesterday I wrote my last final exam of the school year, so today I rewarded myself... with shoes of course! While I did manage to find shoes for myself (two pairs as a matter of fact! ), my favourite purchase of the day? 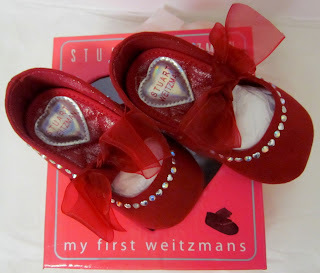 These incredibly cute and just beyond adorable baby shoes from Stuart Weitzman! A friend of mine is having a baby girl and I've been invited to the baby shower. 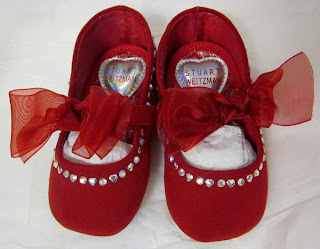 Since there are plenty of family members to take care of the practical gifts like the onesies and receiving blankets, I could think of no better gift for me to give than a pair of designer shoes! Now, from a practical "shoe review" aspect: they are faux suede with a soft fabric sole, heart and diamond shaped embellished collar and pretty lace bow.... but seriously, don't they just make you smile? !